This year has been a year of many conferences for me, most of them being dedicated to sourcing: speaking at SourceCon in Atlanta in February 2013, at Sourcing Summit New Zealand in May, at Sourcing Summit Europe in Amsterdam in September (see a post about it), and just now I returned from SourceCon Seattle October 2-3, which I attended as the prize for winning the sourcecon challenge in February. 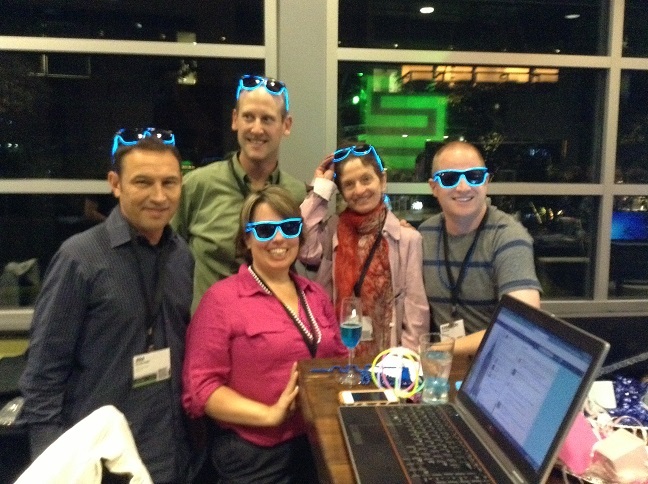 This last Sourcecon gave me a brand new impression, very similar to – and eloquently described – by Lance in his post Sourcing: Beyond Cool Tools to Talent Acquisition Evolution, reposted on sourcecon.com as well. It sounds like sourcing is going “mainstream”. It seemed like more attendees were there looking to be educated and to compare notes with peers (vs. general networking or business development or representing vendors) as the main goal than ever before. It felt good to be among people who are curious and enthusiastic about sourcing. I met three sourcing specialists from large companies (insurance, retail, and consulting), and two more from agencies, all of whom were on the verge of hiring their brand-new sourcing teams, having management buy-in. It’s great news that our profession is getting wide recognition! The Sourcecon’s platinum sponsor Hiringsolved, briefly described in a previous post, was a hit and, as I’ve heard, they had acquired some new customers at the show. The jungle of available tools is so complicated that some companies now have special managers dedicated to selecting proper tools for sourcing. I enjoyed productivity tools’ galleries for “controlling chaos” presented by Julia Stone and by Eric Jaquith (I hope he’ll share his slides publicly as well). 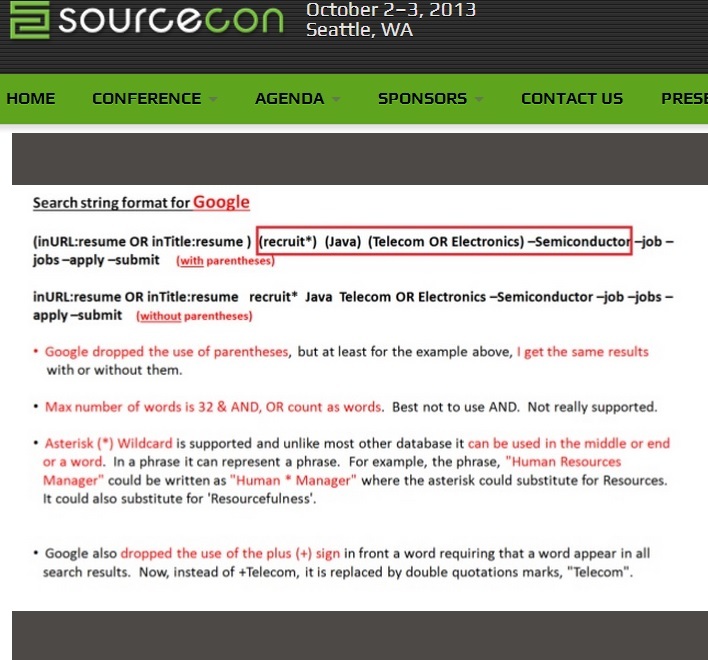 I must say that on the technical side of the sourcing tools presentations SourceCon could do a better job going forward. The presentations should lead the newcomers in our world in the right and up-to-date direction. The slide below is from one of the presentations. Readers who use advanced search on Google will notice several questionable things in the slide, inconsistent with how Google syntax works and with Google help documentation, easily available on its home page. Another presentation recommended to use a metasearch engine to complement search on Google, one that searches “both Yahoo and Bing”. This advice is obviously outdated. In cases like this, the satisfaction level of the audience does not reflect on the quality. It seems like general strategic presentations were appreciated by the attendees. On the photo above: contestants for the After Dark Grand Master Challenge. Some of my other photos from the conference can be found on Google-plus. Thanks for the information. Like you, I also don’t want to put out information that is false. So please help me understand where the error(s) were in the string. I never use Google in my searches. You mentioned going to Google Help. Please share the link you found to these or any other problem areas you found. So please state the errors and solutions links and then publish it so that others won’t make the same mistakes. P,S. I forgot to mention the dropping of the plus sign and replacing it with quotation marks.